Intel may be the biggest chipmaker in the world, but computing is headed in the mobile direction, and the company is ill-prepared. Smaller upstarts like Qualcomm and Nvidia, as well as giants like Samsung and veterans like Texas Instruments, control the company. What does Intel have? The Atom is too big and power-hungry for smartphones and even, possibly, for tablets. Intel needs a change. According to an as yet unconfirmed report from Bloomberg, Intel is very close to entering the mobile business through acquisition–in this case, the company is looking to buy Infineon AG’s wireless unit. 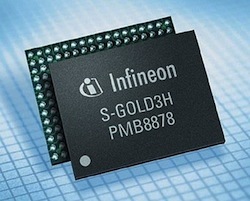 Infineon makes baseboard chips for lots of major phones, including Apple’s iPhone (Infineon has been a partner since the iPhone’s launch in 2007) and Samsung’s Galaxy S line of Android phones (you may not have heard of Galaxy S, but you will–the four phones, one on each major American network, are likely to be the smartphones to buy this fall). That means that Intel would still have to make their own mobile processor, but it indicates more than ever that not only will Intel do so, but that it will be highly competitive. Intel may be flexing its deep pockets right now, but the company will have to put in the work to make a strong product–and sooner, rather than later, would be best.